This project came about as the result of a question in one of the newsgroups. Someone was asking about how to write a color-picker. Far too many times, I've needed a color-picker. 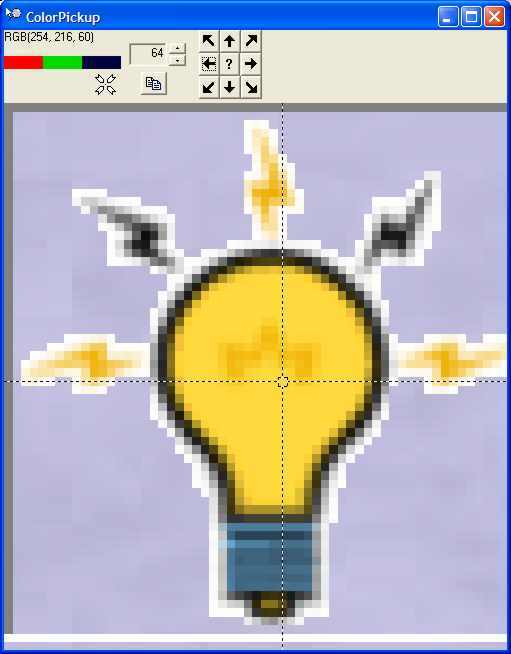 I've also needed to capture pieces of images on the screen to put into other programs, such as icons. The problem is that ZoomIn doesn't support most of what I need to do. I have to get the image right the first time. If I don't have it selected properly, I can't nudge it over. I have get the scaling right. Otherwise I might get too much of the image, or not enough. Once having gotten the image, I can't select a piece of it. Copy-to-clipboard copies the image in the Zoomin window, not the actual pixels that were on the screen.. The original questioner had posed some complicated ways of dealing with the problem, such as using timers and hook functions. These aren't necessary. This project produces an image much like the one below. In order to create this, I set the image size, controlled by the spin control at the top, to 64 pixels. I then took the picker tool, , and dragged it over the screen until I was over the light bulb shown in the heading of this page. I wasn't quite where I wanted, so I used the "nudge" arrows to move it around a bit. While moving around, there is an RGB value displayed at the top right. In addition, the actual R, G and B colors are shown. This represents the actual point where the cursor is placed (although you probably can't see it, there is a little tiny white dot in the middle of the picker tool that represents the cursor hotspot position). The way this is seen on the expanded image is that the dotted square in the center is the hotspot, expanded. The lines extending from the edges are just to make it interesting to find. The ? key in the middle will display a box around the area that is selected. The copy icon button, , will copy the contents of the selection to the clipboard. However, there are additional features. Clicking and dragging within the image area will select a sub-region. This will then be marked with a selection rectangle. Note that the old rectangle does not disappear until the new one is created. This is deliberate, so you can see the old selection while making a new, larger or smaller, selection. This is shown in the figure below and to the left. Note that this image is smaller. I did that by resizing the dialog. In this example, there is a selection box around the base of the lamp. What's interesting about this code? Creation of a Window DC that covers the entire desktop window. Grabbing a piece of the window and saving it as a local bitmap. Selecting a piece of that bitmap. Copying a bitmap to the clipboard. Having a "picker" tool (much like you would recognize from Spy++). Noting that you can in some cases interchange cursors and icons, which is what I did here. Creating a CWnd-derived popup window (the implementation of the ? button). The use of the implicit SetBkMode(OPAQUE) to create lines that are alternating colors, so the line shows up whether the background is light or dark. Computing points in logical space and translating them to device space (the array of points used to draw the highlighting square in the first image). Note that the horizontal and vertical lines are actually a "fractional pixel" in logical space, and there is a trick to accomplishing that. Owner-draw buttons (those arrow buttons, and the copy button).